ARSENAL F.C. ALL IN GOOD CONDITION, NO WRITING, MINOR FOLDS IN 5 FOLDS. Cardiff City v Tottenham Hotspur - League Division 1 - 23/03/1955 at The Ninian Park Ground. Chelsea v Tottenham Hotspur - League Division 1 - 15/10/1955 at Stamford Bridge. Cardiff City v Tottenham Hotspur - League Division 1 - 20/04/1957 at The Ninian Park Ground. Fair condition, folded, wear to folds (see scan) clean, one team change noted on the team sheet page. Wolverhampton Wanderers v Tottenham Hotspur - League Division 1 - 18/04/1956 at The Molineux Grounds. Chelsea v Tottenham Hotspur - League Division 1 - 13/11/1954 at Stamford Bridge. As original copies of this item fetch in the region of £500, here is an opportunity to obtain an excellent quality facsimile at a fraction of the price. This item is discreetly marked as a reprint on the middle page. Rare complimentary programme v.good condition for the age. No writing. Chelsea v Tottenham Hotspur - League Division 1 - 26/10/1966 at Stamford Bridge. Piece missing at the top of the Handbill with minimal text loss otherwise g enerally good. Leicester City v Tottenham Hotspur, (Div 1), 30.4.1962. There is a small “swp” wrote to the front and back cover, otherwise a good condition crease free programme. (See photos). X49 Matchsheets. 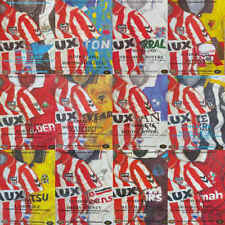 These matchsheets would look so fantastic in any ones collection. SCARCE 64 YEARS OLD ! VERY GOOD CONDITION - NO PEN MARKS - NO WRITING. INC FOOTBALL LEAGUE REVIEW. 23 /9/1961 - NOTTS FOREST - DIVISION 1 - VGC. 26 /10/1966 - CHELSEA -DIVISION 1. 14/10/1967 - COVENTRY CITY - DIVISION 1. 25/11/1967 - WEST BROM -DIVISION 1. 30/12/1967 - FULHAM. Sunderland v Tottenham Hotspur, (Div 1), 26.3.1966. The programme has a faint horizontal crease and a “28” wrote in pencil to the cover otherwise good condition. (See photos). Manchester United v Tottenham (Div 1), 9.9.1961. The programme has team changes within, otherwise good condition. Token intact. (See photos). Manchester United v Tottenham 1956/57 Condition is excellent. TOKEN INTACT No writing No rips or tears Very flat A really nice example from this tricky season. This was the first season United used tokens in the programme and, due to getting to the Cup Final, the token is usually missing. LEEDS UTD V SPURS DIV1. DEC 26th 1959. CENTRE PAGE. SCORES & SCORERS. Chelsea v Tottenham Hotspur 4-4-1970. A great gift for a West Ham or Spurs fan. Chelsea v Tottenham Hotspur - League Division 1 - 21/12/1957 at Stamford Bridge. Wolverhampton Wanderers v Tottenham Hotspur, (Div 1), 3.2.1962. The programme has a very faint horizontal crease and neat team changes within otherwise good condition. (See photos). 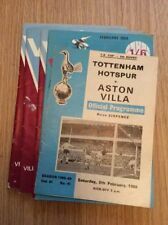 Arsenal v Tottenham Hotspur Div 1 65-66 Mint condition. Arsenal v Tottenham Hotspur. Div 1 Fixture. Excellent Condition. TOTTENHAM HOTSPUR v ARSENAL. LEAGUE DIVISION 1 1973-74. OCTOBER 13. 1960-1 Fulham v Tottenham Hotspur division one 25-3-61. Spurs famous double season. Programme in very good condition. All as photos show. Team changes. Stoke City v Tottenham Hotspur, (Div 1), 9.9.1964. 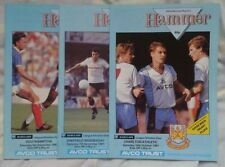 The programme has a horizontal crease, some staple rust present and team changes otherwise good condition. (See photos). Birmingham City v Tottenham Hotspur, (Div 1), 15.12.1962. The programme has a faint vertical crease and team changes within otherwise good condition. (See photos). League match 22 March 1958, faults listed within conditions above.